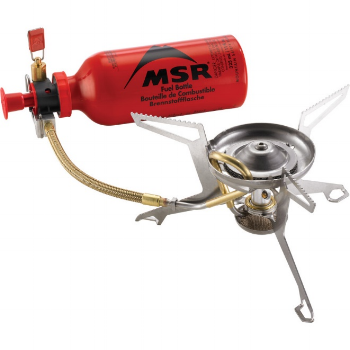 If you’ve ever been backcountry camping, especially hiking, you’ve probably realized that the big green propane canisters, and bulky stoves that they connect to are not very practical. They’re large and heavy, and are mainly meant for front-country “car” camping, for which they’re often very useful. Although they are incredibly easy to use, and to put together, there are a few problems with these screw-on stoves. First is balance. Unless you have a very flat surface, or can create one, the narrow base combined with the weight of a full pot on top makes for a very shaky cooking experience. Second is the cost. A large fuel tank can cost as much as $15 dollars, and will last you just over 3 hours on full power (based on my own experiment). Since they are not refillable, once used up you also need to dispose of them, which must be done at a recycling depot. Meaning, on longer trips, you’ll be carrying around a lot of empty metal cans. Finally, as the fuel release valve is directly below the flames, it can be a little bit dangerous trying to adjust the temperature, especially if the ground is slightly uneven. Some manufacturers have gotten around this problem by creating larger fuel valves (see the picture on the left above), but it’s still something we find frustrating. For all of their flaws, the screw-on stove remains incredibly popular for the simple reason that it is incredibly easy to use, and extremely reliable. There are only 2 parts and they can be put together and started in a matter of seconds. Once it is screwed together, simply turn on the fuel, and add fire. The second system is the WhisperLite, shown here. Much like the screw-on types, these stoves come with a host of advantages and disadvantages. Let’s start with the disadvantages. Compared to the screw-on stoves, the WhisperLite is much more difficult to use. It takes a bit of practice, and a general understanding of the rules of thermodynamics. Don’t use this stove without at least having attempted grade 11 physics. The first thing you notice about the WhisperLite is that it has more parts than the screw-on types, and will require a bit of assembly. Getting this stove started takes minutes, not seconds. We’ll go into more detail in another entry, but getting this thing going can be a bit of a hassle the first few times. The second disadvantage is that the WhisperLite is more prone to breakage. Because of the additional moving parts, there are more items that can break or get clogged. I’ve found that by using this stove on a sandy site, its functionality was drastically reduced until it was taken apart and all of the components cleaned. The third issue is that in order for the fuel to turn to its gaseous state, the stove needs to be heated before using. In laymen’s terms, you basically have to light the whole thing on fire before even using it. This can cause problems in the winter, as it can take a lot of time for the coil to heat, and you’re probably already cold and cranky. So why consider the WhisperLite over a basic screw-on stove? The main advantage is the fuel. The WhisperLite can take many different types of fuel, and is refillable. This means that on long trips, you can get by with just one large fuel tank, instead of several smaller ones. This can also save you a lot of money, as certain fuels are far cheaper than the isobutane or propane needed for the screw-on variety. The second advantage is balance. The WhisperLite sits lower to the ground and has a larger base, allowing you more stability when you cook. This may sound trivial, but on an uneven surface in bad weather, the extra stability is nice to have.